Sandi Chasson, Department Head of Music, says students who participate in the Music program not only develop technical facility and musical literacy, but they also leave the program with a love and appreciation of music. "It’s not only about academics and athletics; St. Andrew’s has a vision of excellence for the School, which includes incredible support for the arts. They’ve established a place where kids have an opportunity to explore their own music,” says Ms. Chasson. 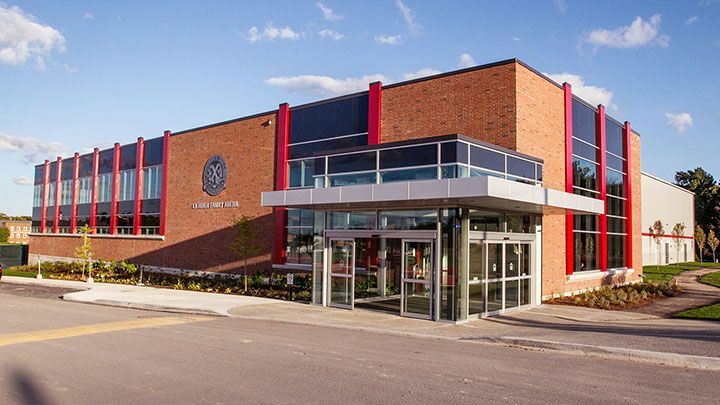 Boys from grades 5 through 12, are invited to explore all kinds of music at St. Andrew’s, including curricular instrumental band classes (wind and percussion), or regimental piping and drumming classes. The Pipes & Drums program, which continues to thrive and cultivates a wealth of musical talent, is one of the leading programs of its kind in Canada, and is a unique and age-old tradition at the School. Double-gold medalist, Jim McGillivray, Director of the Piping, is touted to be one of the world’s best all-round pipers ever, inspiring a high level of musicianship. Many students go on to perform in the world’s leading pipe bands. Strings and Jazz are also offered as extra-curricular options for the boys outside of class time, and there are many opportunities to perform throughout the year both on and off campus. 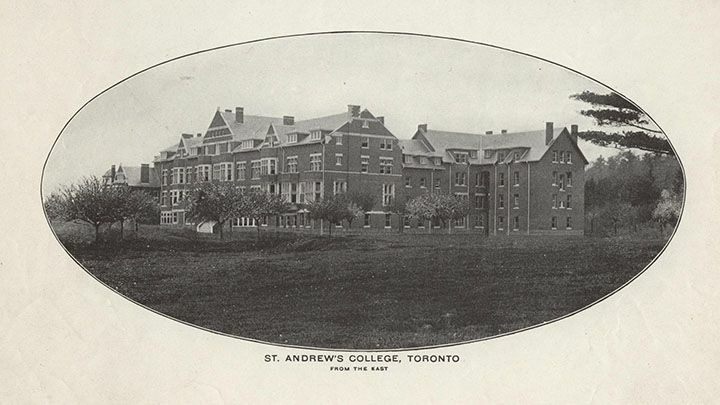 Every year, St. Andrew’s hosts a three-day festival of plays, films, visual arts, music, and social events for students, parents, and guests. For over 25 years, boys who have never been involved in drama are encouraged to participate in the Focus Festival of the Arts by writing their own plays, directing, producing, or acting in performances large and small. St. Andrew’s offers boys an exciting opportunity to explore the world through drama. Through role-playing, script writing, and character development, students create situations and actions which allow them to make sense of their world, and to respect and appreciate diversity. More than half of the student body takes part in the 30 or more plays staged at the School every year. Boys receive their first introduction to drama by working on a major production of a classical play in the fall. As Head of Drama, Oxford University graduate, William Scoular – actor, director, and celebrated author – brings a wealth of knowledge and experience to the School. From classical plays to experimental theatre, students have an opportunity to act, direct, or be technically involved in contemporary, classical, and devised monologues, scenes, one-act plays, and full-length productions. Art is alive and regularly on display at St. Andrew’s! 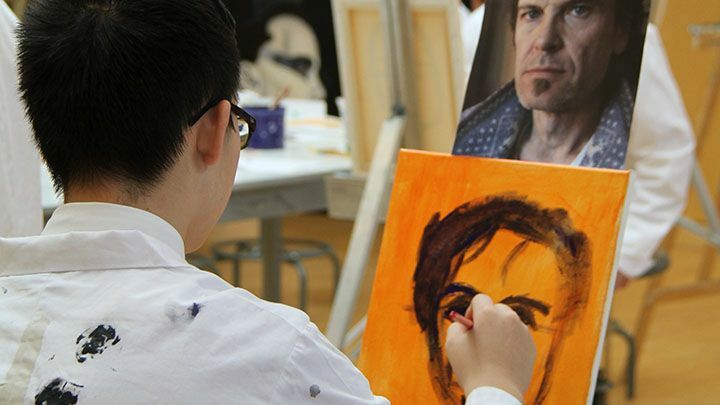 Middle School students who choose a Visual Arts stream enjoy virtually unlimited resources and participate in a variety of media: painting, sculpture, ceramics, printmaking, and more. While many of the students are really intimidated at the beginning, Randi Berman, Arts Coordinator and Middle School art teacher, explains that students don’t have to have any skills to come into her art class. “I pick assignments in September that allow everybody to be successful. I tell them something cool is going to happen and sure enough, they’re all really proud of their first work. It gets their self-confidence up in art, and I often hear, ‘Wow, I was never really good at art, until now,’ from many of my students,” says Ms. Berman. Upper School students are offered a comprehensive program in Visual Arts, creating their own works in our dedicated studios. This experience is enriched through the study of other artists, together with numerous field trips to museums, galleries, and local artists’ studios. The Upper School Art teacher, Matthew Wyatt, is an accomplished artist, who teaches with passion, dedication and skill. Like any artist or musician, he finds that his teaching skills are very much enhanced by his own work. Upper School students are also invited to navigate through our exciting Media Arts program, taught by Head of Art, Stephen Kimmerer. The program boasts state-of-the-art facilities and all the latest industry standard software available. In an increasingly visual world, computer-generated media present infinite possibilities for students who want to explore graphic design, produce websites, and direct or edit their own digital movies.